"For Esmé—with Love and Squalor" is a short story by J. D. Salinger. It recounts a sergeant's meeting with a young girl before being sent into combat in World War II. Originally published in The New Yorker on April 8, 1950, it was anthologized in Salinger's Nine Stories two years later (while the story collection's American title is Nine Stories, it is titled as For Esmé—with Love & Squalor in most countries). The short story was immediately popular with readers; less than two weeks after its publication, on April 20, Salinger "had already gotten more letters about For Esmé than he had for any story he had published." According to biographer Kenneth Slawenski, the story is “widely considered one of the finest literary pieces to result from the Second World War. Author Paul Alexander calls it a "minor masterpiece". When Salinger submitted the story to The New Yorker in late 1949, it was at first returned, and he then reedited his manuscript, shortening it by six pages. The story is present in three parts, an introductory passage, followed by two episodes. The first of the two episodes begins almost six years before the introduction. The story begins with the narrator needing to respond to a wedding invitation that will take place in England, and which the narrator will not be able to attend, because the date of the wedding conflicts with a planned visit from his wife’s mother. The narrator does not know the groom, but he knows the bride, having met her almost six years earlier. His response to the invitation is to offer a few written notes regarding the bride. These notes are the story. The first of the two episodes the narrator relates occurs during a stormy afternoon in Devon, England, in 1944. A group of enlisted Americans are finishing up training for intelligence operations in the D-Day landings. He takes a solitary stroll into town, and enters a church to listen to a children's choir rehearsal. One of the choir members, a girl of about thirteen, has a presence and deportment that draws his attention. When he departs, he finds that he has been strangely affected by the children's "melodious and unsentimental" singing. Ducking into a tearoom to escape the rain, the narrator encounters the girl again, this time accompanied by her little brother and their governess. Sensing his loneliness, the girl engages the narrator in conversation. We learn that her name is Esmé, and that she and her brother Charles are orphans – the mother killed in the Blitz, the father killed in North Africa while serving with the British Army. She wears his huge military wristwatch as a remembrance. Esmé is bright, well-mannered and mature for her age, but troubled that she may be a "cold person" and is striving to be more "compassionate". In the next episode, the scene changes to a military setting, and there is a deliberate shift in the point-of-view; the narrator no longer refers to himself as “I”, but as “Sergeant X”. Allied forces occupy Europe in the weeks following V-E Day. Sergeant X is stationed in Bavaria, and has just returned to his quarters after visiting a field hospital where he has been treated for a nervous breakdown. He still exhibits the symptoms of his mental disorder. "Corporal Z" (surname Clay), a fellow soldier who has served closely with him, casually and callously remarks upon the Sergeant’s physical deterioration. When Clay departs, Sergeant X begins to rifle through a batch of unopened letters and discovers a small package, post-marked from Devon, almost a year before. It contains a letter from Esmé and Charles, and she has enclosed her father’s wristwatch - "a talisman"- and suggests to Sergeant X that he "wear it for the duration of the war". Deeply moved, he immediately begins a recovery from his descent into disillusionment and spiritual vacancy, regaining his "faculties". As the war receded in memory, America was embracing an "unquestioned patriotism and increasing conformity", and a romantic version of the war was gradually replacing its devastating realities. Salinger wished to speak for those who still struggled to cope with the "inglorious" aspects of combat. For Esmé – with Love and Squalor was conceived as a tribute to those Second World War veterans who in post-war civilian life were still suffering from so-called "battle fatigue" – post-traumatic stress disorder. The story also served to convey to the general public what many ex-soldiers endured. Salinger had served as a non-commissioned officer of intelligence services at the European front – the narrator "Sergeant X" is "suspiciously like Salinger himself". The story is more than merely a personal recollection; rather, it is an effort to offer hope and healing – a healing of which Salinger himself partook. Slawenski points out that “though we may recognize Salinger in Sergeant X’s character, [WWII] veterans of the times recognized themselves." In 1963, film and TV director Peter Tewksbury approached Salinger about a making film version of the story. 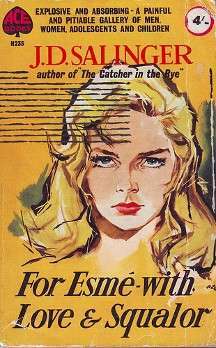 Salinger agreed, on condition that he himself cast the role of Esmé. He had in mind for the role Jan de Vries, the young daughter of his friend, the writer Peter de Vries. However, by the time that Salinger and Tewksbury had settled on the final version of the script, Jan had turned eighteen and was considered by Salinger to be too old for the part. The film was never made. ↑ Salinger, J. D. “For Esmé—with Love and Squalor”. The New Yorker. April 8, 1950. P. 28. 1 2 Alexander, Paul (1999). Salinger: A Biography. Los Angeles: Renaissance. ISBN 1-58063-080-4. p. 144-5. ↑ Jill Lepore, "Esmé in Neverland - The film J.D.Salinger nearly made", The New Yorker, November 21, 2016. Salinger, Jerome D. 1950. For Esmé – with Love and Squalor in Nine Stories. Little, Brown and Company. New York (1981).